Marmore Falls is a controlled flow waterfall, among the highest in Europe, relying on a total drop of 165 m, divided into three jumps. It is located about 7.5 km away from Terni, in Umbria, near the end of Valnerina, the long valley carved by the river Nera. The name is derived from calcium carbonate salts present on the rocks that are similar to white marble. The waters of the waterfall are intensively exploited for the production of electrical energy, in the Galleto. This causes the true waterfall itself does not constantly working, but for most of the time is reduced to the size of a stream. The basin of Lake Piediluco acts as a reservoir for the central, built in 1929, capable of producing electricity with a capacity of about 530 MW. To regulate the operation of the station and to allow the vision to all, in defined, the waterfall schedules and periods is operated at maximum capacity: a beep warns the opening of the control gates, and within minutes the flow rate increases up to maximum value. Normally, the cascade works a couple of hours a day, with extended hours of operation on the occasion of holidays. You access to the best vantage points by paying an entrance fee. The waterfall is formed by the river Velino that, near the hamlet of Marmore (376 m s.l.m., 802 inhabitants according to the 2001 ISTAT data), it flows from Lake Piediluco and dives with noise below the gorge of the Nera. Normally only a portion of the water of Velino (average flow rate of 50 m³ / s) River is diverted towards the waterfall (about 30%, equivalent to about 15 m³ / s). It is part of the Nera river park. The flora and fauna at the falls is typical of the Mediterranean. The waterfall is characterized by the extraordinary biological richness. There are many plants belonging to both primitive forms (blue and green algae, mosses, liverworts and lichens), both evolved organisms like macromycetes; aquatic and terrestrial ones vascular plants (ferns and flowering plants). To these must be added the numerous botanical species zoological species belonging to insects, amphibians, fish, reptiles, birds and small mammals. 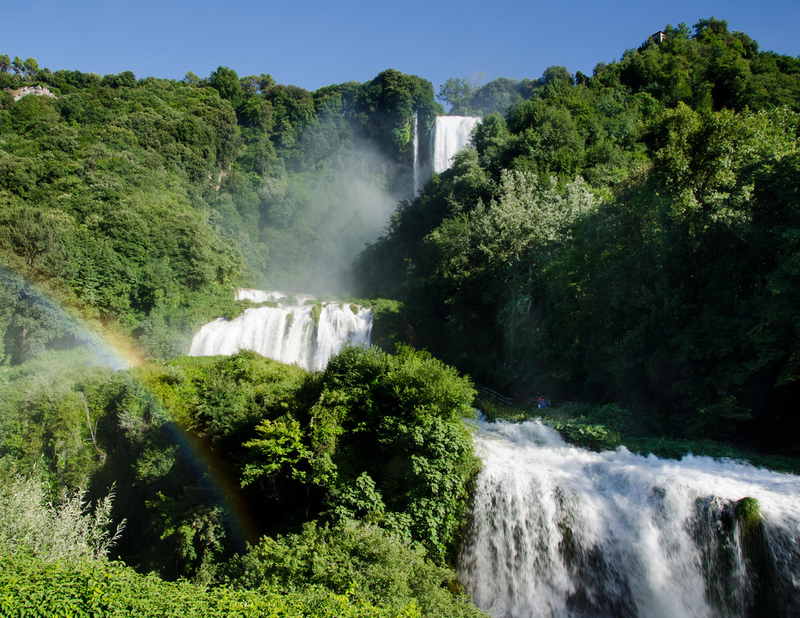 The importance of this biodiversity is reflected in the fact that the area of the park of the Marmore Falls was recognized at European level as SCI (SCI) and Special Protection Area (SPA) of the European Ecological Network Natura 2000. They are present rare bird species or even unique in Italy. Some examples: The Dipper and Grey Wagtail feeding along the banks and in the bed of the Black; colorful Kingfisher that can be observed during winter migrations; The mountain and the lonely Sparrow Swallow nest in bare rock walls and white Ballerina builds its nest of mud under the roofs of the houses next to the waterfall; the Nightingale that inhabits the hygrophilous vegetation; the moorhen and mallard.